Carl Judson of Kingston loaded a chest freezer into his vehicle at Lowe&apos;s in Pembroke on Saturday morning. Judson said he saved about $30 on the purchase. 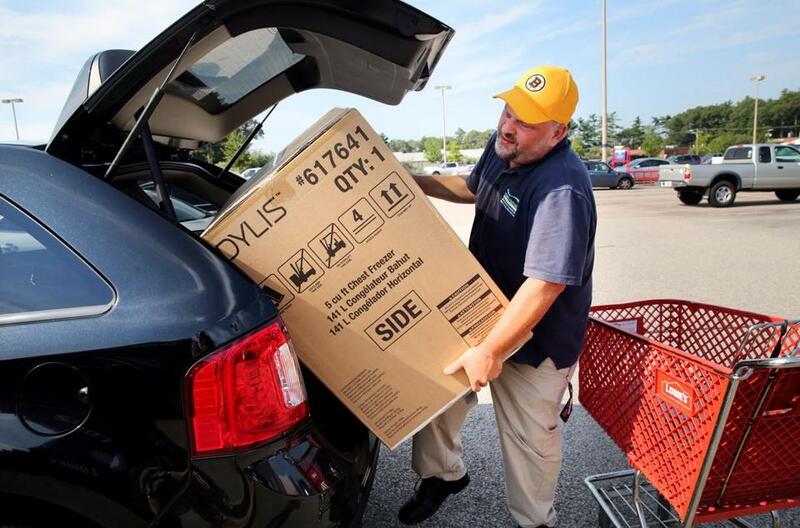 It’s becoming a tradition in Massachusetts: As summer wanes, residents get a weekend of sales-tax-free shopping. 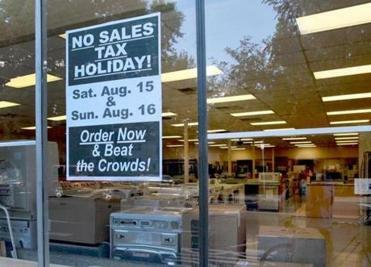 The state’s two-day sales tax holiday takes place Saturday and Sunday, when consumers can make purchases without paying the tax, which amounts to 6.25 percent of the purchase price. In recent years, more people have bought into the holiday, spending greater amounts of money and in turn saving more. Consumers saved $24.6 million during the weekend in 2014, compared with $14.9 million in 2008, according to the state Department of Revenue. Critics of the holiday say it only diverts shoppers from making the same purchases at other times of year, when the tax is in effect. But since 2004, the tax holiday has been signed into law by the Legislature 10 times. The only exception was during the Great Recession of 2009. Customers will get a short reprieve from the 6.25 percent levy for purchases of nearly all retail items that cost less than $2,500. Here’s everything you need to know before you head out to the stores this weekend. What’s covered by the sales tax holiday? The sales tax break applies to purchases of single items under $2,500. If you wanted to buy a $3,000 computer, for example, you’d still be fully taxed, but a device costing $1,500 would be covered by the tax holiday. Shoppers can buy an unlimited number of items as long as each one is below the $2,500 threshold. Does this apply to everything? There are some exceptions to the law. You’ll still need to pay the food tax at restaurants. Cars, motorboats, and other motor vehicles are not tax-free this weekend. Utilities such as gas, steam, electricity, or telecommunications services aren’t covered. Cigarettes, cigars, and other tobacco products are also excluded. The other caveat comes with clothing purchases. Already under state law, articles of clothing are not taxed unless they cost more than $175. During the sales tax holiday, however, clothes will only be taxed if the cost of the clothing article exceeds $2,500. Shop wisely. One consumer activist says the deals may not be as good as they seem. Edgar Dworsky, founder of ConsumerWorld.org, an Internet consumer resource guide, urged buyers to do their homework before heading to the stores. He said at some national chains, doorbuster sales may be a better deal than the 6.25 percent you’ll save this weekend. The national chains may not coordinate their doorbuster sales with the holiday. Dworsky said people should check prices at multiple stores and online to determine whether they’ll be getting a good price, a great price, or just an everyday price. In that case, it might be a good idea to wait until the item goes on sale, Dworsky said. One thing to remember is that rebates are not counted when the item is heading toward the $2,500 threshold. If the item costs more than $2,500 before the rebate, it will be taxed, he said. So if it’s not a good deal, why do it? Dworsky said there’s something other than the allure of savings that may draw flocks of people to stores during the sales tax holiday weekend. “There’s something about it and the psyche of the Massachusetts shopper,” he said.